Being a loyal subscriber of globe for years now, I've seen how the network evolves to meet the needs of its subscribers and or market. How satisfactory the service they provided to everyone in terms of promos, combo loads and the like. This seems to be making each individual an on-the-go. Providing the subscriber particularly the vast number of prepaid users a Better and Bigger offers that no competitors ever have. 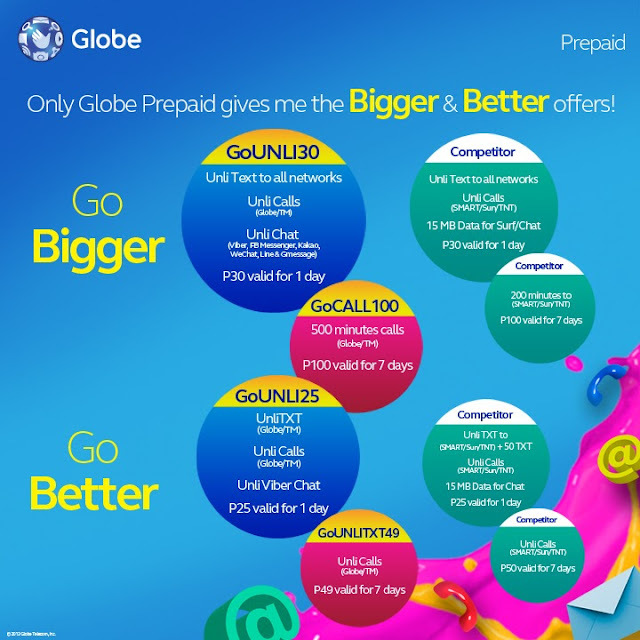 With its Bigger and Better unli offers to all prepaid users, Globe make an edge of being one of the unparalleled telecom provider that thoroughly look into fine details of subscribers needs. Ø GoCALL100 gives me more call minutes (500 mins) VS Competitors offer (200 mins). No need to use prefix to enjoy unlicalls. 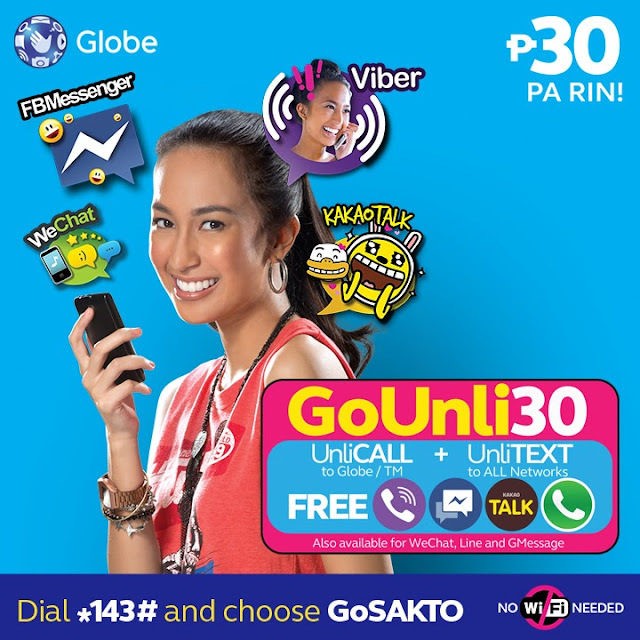 Ø With GoUNLI30, I get real unlimited service with unli allnetwork texts, unli calls to Globe TM, plus the real UNLI-chat experience with the best apps available. It’s the real deal compared to competitor’s UNLI offer. o GoUNLITXT49 gives me the same UNLI texts to Globe/TM at a BETTER prices VS Competitors offer. o With GoUNLI25, I get real unlimited service w/ unli Globe/TM calls and texts, plus unli Viber chat to the rest of my friends. It’s the real deal compared to competitor’s UNLI offer. However, if I were to choice, I'd rather Go Bigger for the reason that I am a blogger and being connected to my social media platforms is a must for me to be able to bond to my readers and update them about anything and everything about random bit and pieces. The price wise of 30pesos, you can already enjoy unlimited call, unlimited text and most of all, unlimited chat that wherever you are right now, you can easily get in touch with by your love ones. It's not only you who is enjoying the promo of Globe but, and would love to share this to my friends, especially my family. So they're the people who are the best to spend this Globe Prepaid promo with. By this, I can say that this is indeed a Bigger offer and Better than the other.